BOULDER – North America’s oldest bike-racing title, VeloNews, has named Fred Dreier executive editor. One of the cycling industry’s most well-respected journalists, Dreier will contribute to VeloNews on all platforms. He brings his lighthearted writing style and analytical perspective to VeloNews.com as a regular columnist. His print feature in the July issue of VeloNews profiles the Red Hook Criterium and the growth of fixed-gear road racing. Dreier will oversee VeloNews’ new weekly digital program The VeloNews Show, which features spirited debate and humorous perspectives on the sport’s biggest news stories and race results. The programs will deliver stories and insight from the 2016 Tour de France, which begins this weekend. 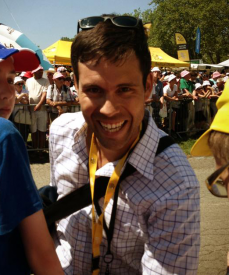 Dreier started his career in media as an intern at VeloNews in 2004 and then worked as a reporter and junior editor with the publication from 2005-09. He left to pursue a master’s degree at Columbia University’s Graduate School of Journalism and graduated in 2010. Dreier was a staff writer with The SportsBusiness Journal, where he covered the business of the NHL, Major League Soccer and the endurance sports industry. He most recently served as a sports correspondent for The New York Times, USA Today and Wall Street Journal, where he regularly wrote about professional cycling, soccer and the running industry. Dreier’s reporting helped shed light on the growth of doping within amateur endurance sports and on the rise of deaths by cardiac arrest in triathlons. Known as the “Journal of Competitive Cycling,” VeloNews has reported on and helped shape American bike racing culture for decades. The brand takes readers behind the scenes of all of cycling’s biggest races and most important stories, with breaking news, commentary, humor, and deep dives into cycling culture. Publishers of the official North American guide to the Tour de France, VeloNews delivers the most authentic and authoritative editorial and marketing packages within the cycling industry, to a qualified and influential audience. VeloNews has more than 40 years of history delivering compelling content that informs and entertains cycling enthusiasts worldwide. Online since 1994, VeloNews.com delivers the most timely, trusted cycling content on the web. For the latest cycling news, race results and more, visit VeloNews.com or follow @VeloNews on Twitter.